Does it Pay to Treat Dry Cows for Worms? 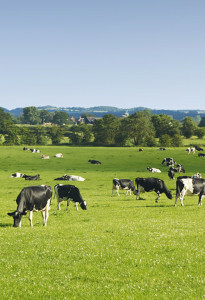 We often get asked if it is worthwhile to treat adult dairy cows for worms. The answer to this question is more complicated than a simple yes or no. In Australia there are very few published studies that examine the benefits of treating dairy cows for worms and other internal parasites. There are a lot of trials overseas which demonstrate a response to treatment, but these studies have been undertaken in completely different management systems to those encountered in southern Australia. In a trial in northern NSW (1) undertaken in 1992, examining 1239 cows in twelve herds there was a slight production response to an oxfendazole and oxyclosanide drench given on three occasions during lactation of 0.4litres per day. In western Victoria the results of two treatment trials have been published in the last 25 years. In the first trial undertaken in 1992 (2) involving 498 cows on five farms, when treatment with an injectable ivermectin product was given around the time of drying off, there was overall a response of 74 litres of milk in the first 100 days of lactation and 2.3kg protein. In these herds there was overall a positive response to treatment in calving to conception interval of 4.8 days. However, there were no observed difference between treated and untreated animals in body condition score and milk produced for the total lactation. Differences between treated and untreated animals were observed for faecal egg counts at calving, and plasma pepsinogen at calving (this enzyme is a measure of stomach damage due to worm infestation). In a second treatment trial undertaken in 1997 (3) involving western district dairy herds, as well as herds in northern Victoria, Gippsland, Tasmania and South Australia, half of all cows were treated with an eprinomectin based pour-on around the time of calving. In all 2599 cows were enrolled. In this trial nearly half had a positive but low faecal egg count. Overall, there was a production benefit of 47 litres of milk and 4kg of milk solids (1.8kg fat and 2.2kg protein) in the first 100 days of lactation. In heifers milk production response was higher at 65 litres, and there was a significant protein response of 2.4 kg. Over the whole lactation, there was an extra 5.6kg milk solids (2.8kg fat and 2.8kg protein) so the response falls off after 100 days. No results were published for responses in fertility due to treatment. A similar trial (4) was also conducted at the same time in New Zealand on three farms involving 849 animals and showed positive production responses of 0.4 litres milk per day, and 11g milk protein per day (40 litres of milk and 1.1kg of protein over 100 days). The authors concluded there was an economic response to treatment. Trials which show no response often don’t get published. The adult dairy cow usually has a strong immunity to worms, so when we do worm counts they are usually low. Plasma pepsinogen is an alternative measure of worm infestation as it indicates the level of stomach damage due to worms. When the trials were undertaken cow production was lower than today’s measures. Modern dairy cows are under greater production stress, and when combined with the reduction in the cow’s immunity around calving, treatment for worms around calving would seem to be the most logical time to treat. Treatment at drying off gives cows time to become reinfected by the time they calve, but as shown above there can be production and fertility benefits. Worm burdens can be assessed from faecal samples, but a more reliable measure is pepsinogen which requires a blood test. However, the faecal egg count is cheaper and easier to do and is an alternative to the blood test but has serious limitations. If you would like us to organise testing of your animals give us a call. By doing this we can advise whether there might be production benefits in your herd when treated for worms sometime in the dry period. If you would like us to organise testing of your animals give us a call. By doing this we can advise whether there might be production benefits in your herd when treated for worms sometime in the dry period. NZ Vet J: 49:3, 2001.